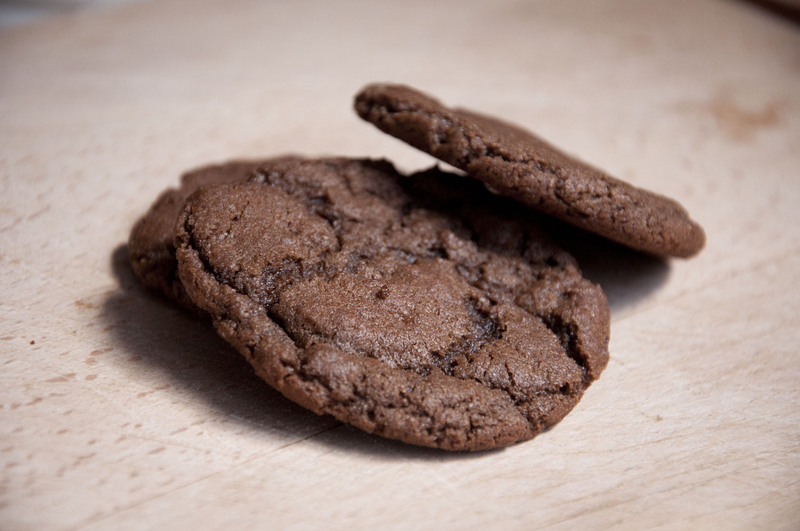 This cookie is very chocolatey and nicely spiced. 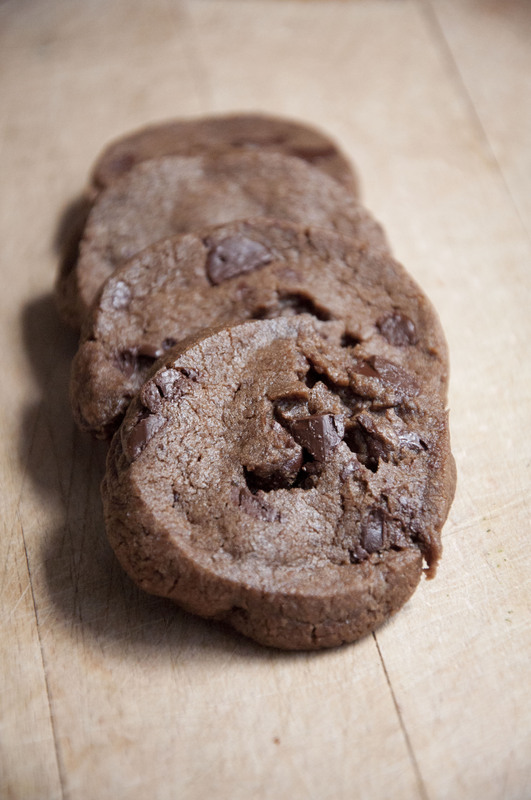 The texture is like a brownie in a cookie form (well, fudgy in that way). 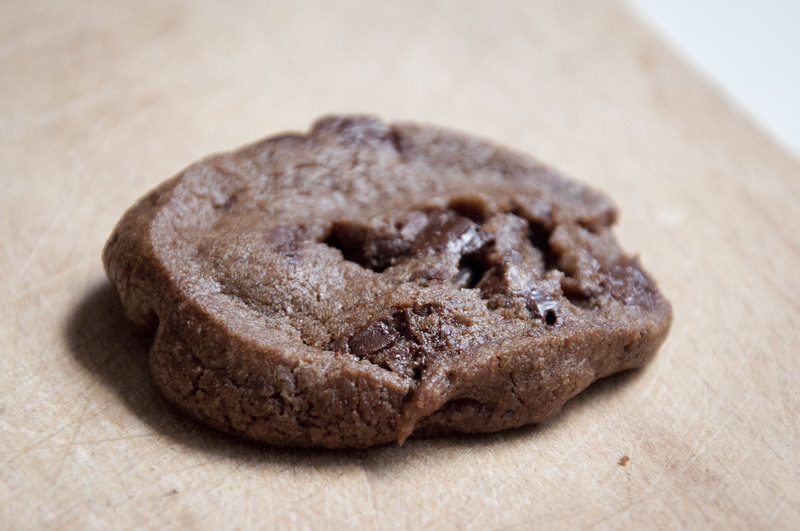 The chocolate bits melt right into the cookie, so make sure to have small pieces. Also, you’ll need to flatten these cookies, because they don’t spread. Included below is the half recipe. 1. Preheat oven to 350F. Prepare baking sheet with silicone/parchment paper. 2. Cream together butter, almond butter, butter. 3. Mix in sugar, vanilla, cinnamon, salt, pepper. 4. Mix in cocoa and flour. 5. Mix in chocolate chips. 6. Roll into balls and roll in sugar. 7. Place on prepared pan and flatten. 9. Bake 8-10 minutes. Enjoy! These cookies are packed with so much chocolate. They’re soft and a bit chewy on the outside and utterly delicious. 1. Beat butter until creamy. 2. Add in sugar, salt, and vanilla. Beat until creamy. 3. Add in cocoa, baking soda, and flour. Mix until combined. 4. Mix in chocolate pieces. 5. Gather dough together into a ball and divide in half. 6. Shape each half into a log that is 1.5’’ in diameter. Wrap in plastic and refrigerate the dough for 3h (or freeze for 1h). 7. To bake: preheat oven to 325F. 8. Slice the dough logs into ½’’ slices. 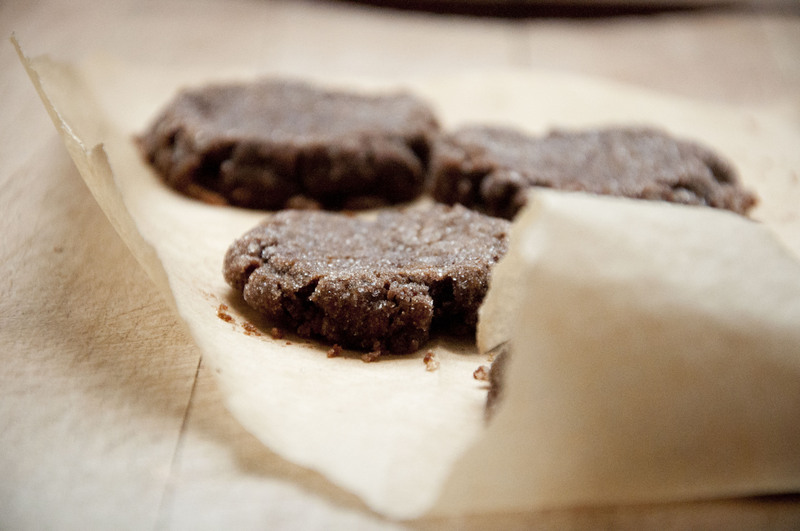 Place cookies on prepared baking sheet (parchment or silicone mat) at least 1’’ apart. 9. Bake 10-12 minutes. Enjoy! SK notes they will not look done at 12 minutes. 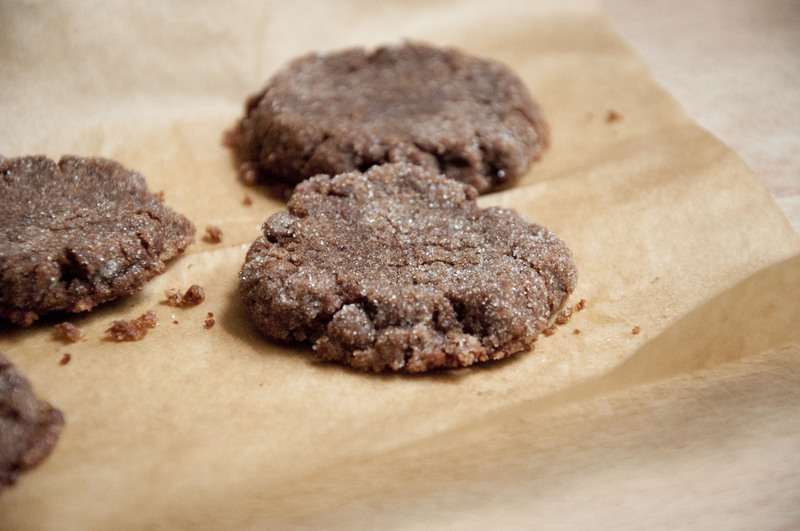 These easy cookies are chewy on the inside and just a bit crunchy on the outside. 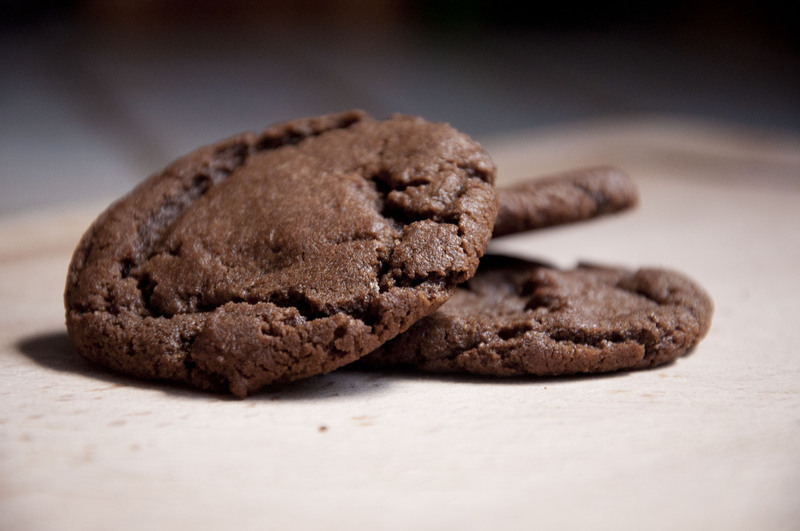 They’re basically a flatter, crisper version of a brownie. You can also freeze these cookies and bake them in the future. 5. Mix in baking soda, baking powder, salt, and flour until a dough forms. 6. Scoop dough using a tablespoon and form balls. Place balls of dough about 2’’ apart, because these cookies spread quite a bit. 7. 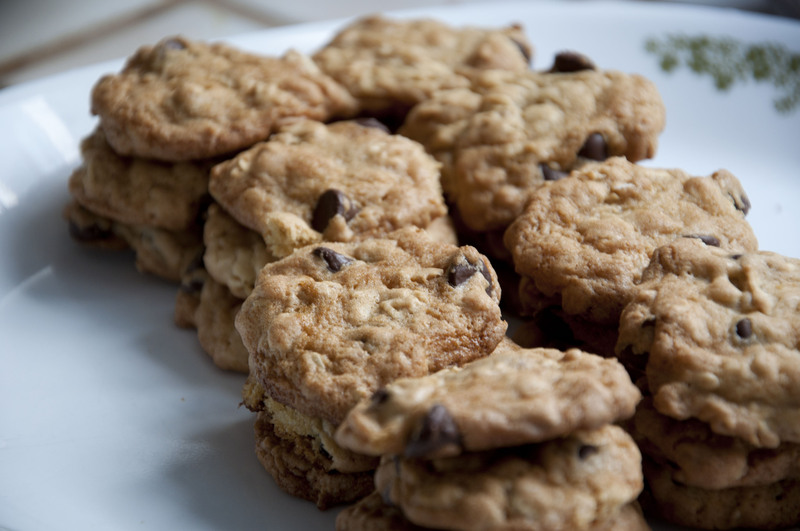 Bake for about 8-10 minutes (shorter for softer cookies, longer for crunchier cookies). Alternately, freeze for future use, and adjust the baking time a bit to account for the frozen dough (only a few extra minutes needed). 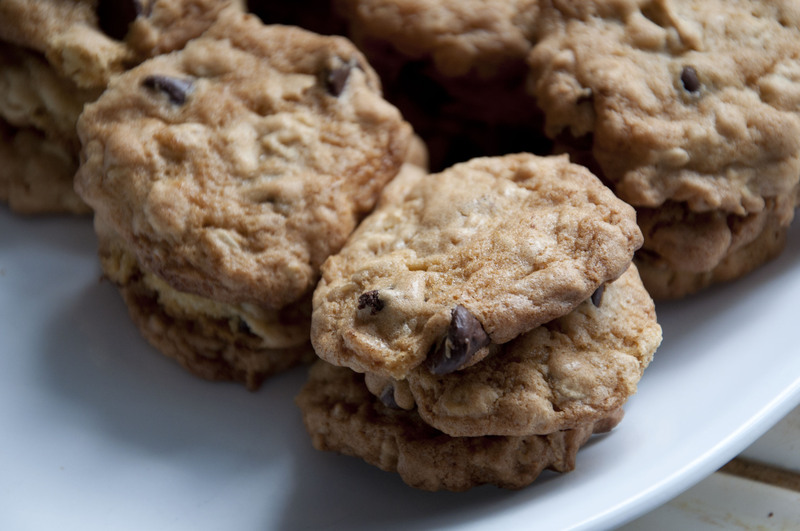 These are some of the best oatmeal chocolate-chip cookies I’ve had. I usually make them with olive oil, which changes the texture a little and makes them marginally healthier, but they’re still delicious. They’re also easy to make, since you only need one bowl to prepare everything. 1. Preheat oven to 350F. Prepare baking pans by greasing them or by lining with parchment papers. 2. If using butter, cream together butter in sugar. Otherwise, mix together oil and sugar. 3. Mix in molasses, eggs, milk, and vanilla. 4. Stir in baking soda, baking powder, salt, and flour. 7. Using a teaspoon, scoop cookie dough onto prepared pan. Leave at least 1cm between cookies, since they do spread a bit. 8. Bake about 8-12 minutes, or until tops of cookie are a bit dull. 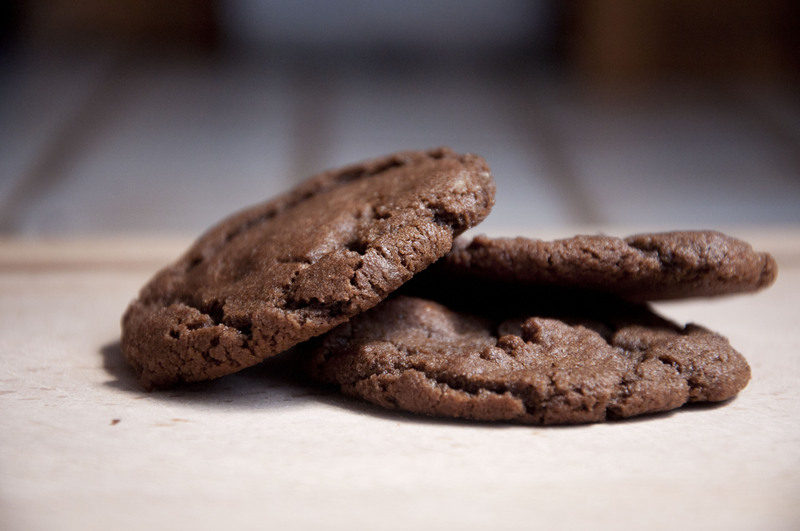 The longer you bake, the crispier the cookie. 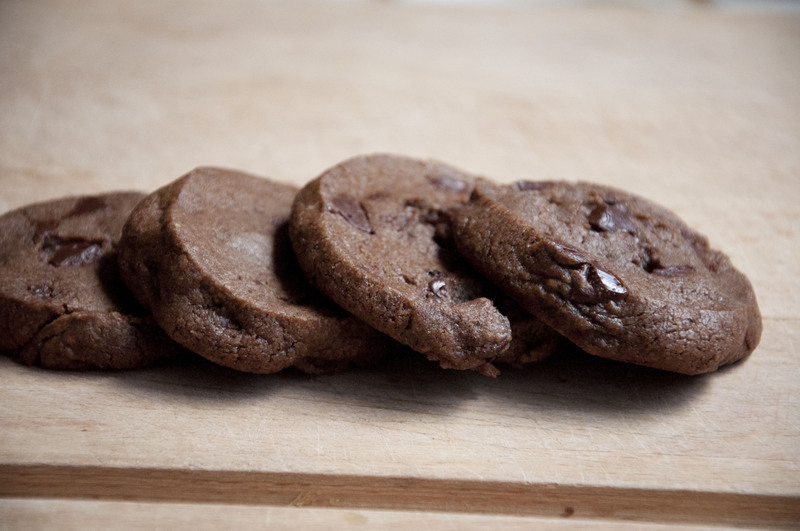 If you like soft and chewy cookies, bake for elss time. 9. Let cool before attempting to remove from pan. Enjoy! I’ve adapted by reducing fat and sugar, so they’re not too sweet—just like the biscotti, actually. They’re still chocolatey, fudgy, and rich. By the way, these cookies don’t spread. 2. Cream butter, sugar, egg, milk and vanilla together. 3. Mix in flour, cocoa powder, baking powder, and salt. 4. Stir in hazelnuts and chocolate chips. 5. Drop by teaspoonfuls onto parchment-lined sheet. 6. Bake 6-8 minutes, until cookies look dull on top.